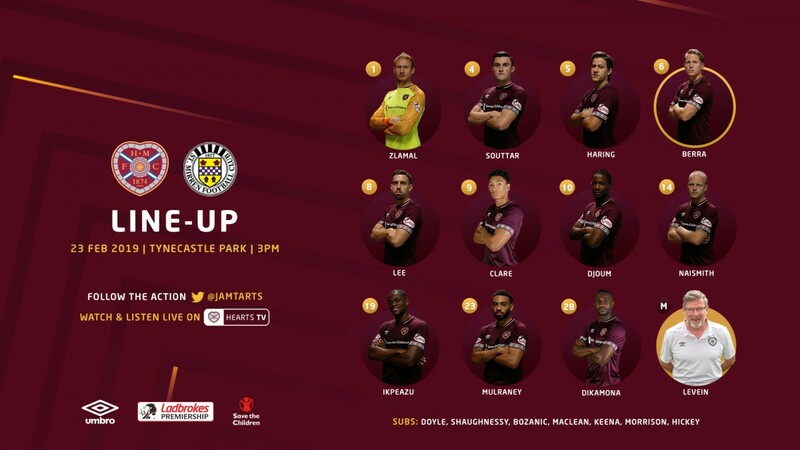 Craig Levein makes four changes from the side that lost at Motherwell last week as Hearts welcome St Mirren to Tynecastle this afternoon. Peter Haring makes the starting line up for the first time in 2019 after undergoing double hernia surgery during the winter break, he replaces Ollie Bozanic. Zdenek Zlamal comes in for Colin Doyle, Clevid Dikamona slots in for Conor Shaughnessy while Olly Lee is handed a start ahead of Marcus Godinho. Zlamal, Souttar, Haring, Berra, Lee, Clare, Djoum, Naismith, Ikpeazu, Mulraney, Dikamona. Subs: Doyle, Shaughnessy, Bozanic, MacLean, Keena, Morrison, Hickey. Can't make the game? Overseas subscribers can watch the game live on HeartsTV, with audio commentary available inside the UK & Ireland. Click here to subscribe to HeartsTV.